Join us for our community planting day, Saturday, November 17th, 9am -Noon. Community planting day is an opportunity to contribute to the restoration and health of local wetlands. Volunteers will be adding native plants to landscape that contribute to habitat enhancement and capture rainwater runoff from surrounding streets, filtering it before it drains into Struve Slough. 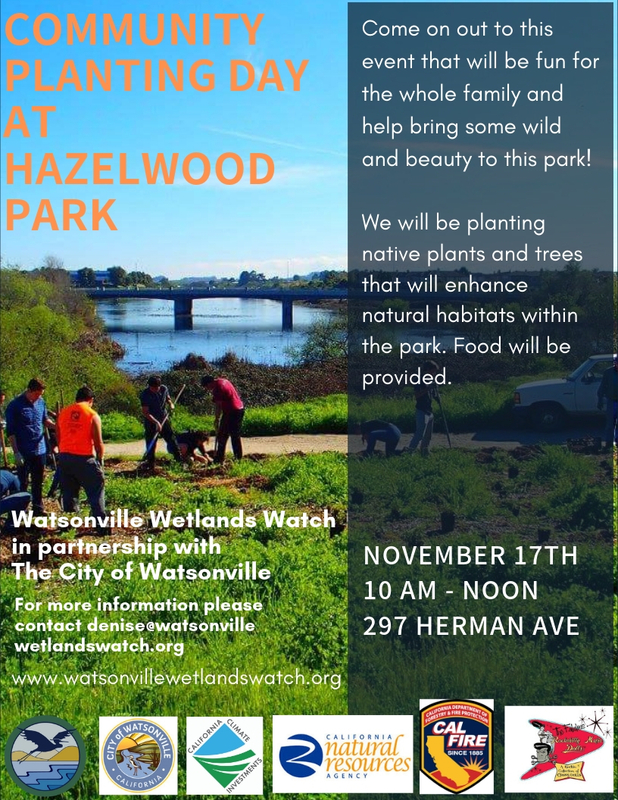 Located near Rolling Hills Middle School this pocket park has a newly paved and improved bicycle and pedestrian trail which has been funded by an Urban Greening Grant from the California Natural Resources Agency to the City of Watsonville and Watsonville Wetlands Watch. Design for the project was completed as a part of the City’s Urban Greening and Trails Master Plan, adopted in 2012. Urban pocket parks, like Hazelwood Park, can be an oasis for both wildlife and our community. Studies have shown these areas can play an incredibly important role for urban birds, increasing diversity and abundance of bird species, while improving air and water quality for neighbors, residents, and wildlife and local fauna.